At 9a.m. 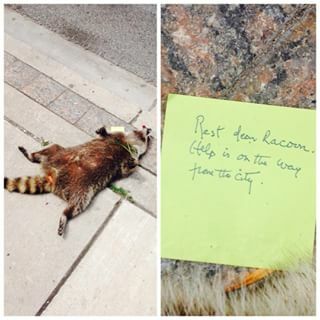 at good citizen of Toronto saw a dead raccoon on the sidewalk. He called the city’s contact center to tell them to come and get it. The city verified 12 minutes later that animal control had been notified and would be on their way. But by noon the raccoon was still there and someone left a note. 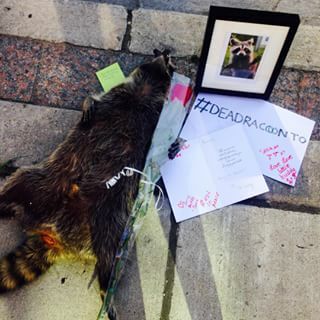 The raccoon still lay there in the afternoon so people started to create a memorial. A city Councillor asked the city to take action. Again the city replied that animal control had been notified. People started adding flowers and condolence cards to the memorial. As the night wore on the raccoon was given a candlelight vigil. A donation box appeared to give the raccoon a proper burial. After 14 hours on the street a city worker came along and placed the raccoon in a garbage bag. The people of Toronto lit one last candle.